Built for the 2002 Winter Olympic Games, Utah Olympic Park was the site of the bobsled, skeleton, luge, ski jumping, and Nordic combined events. 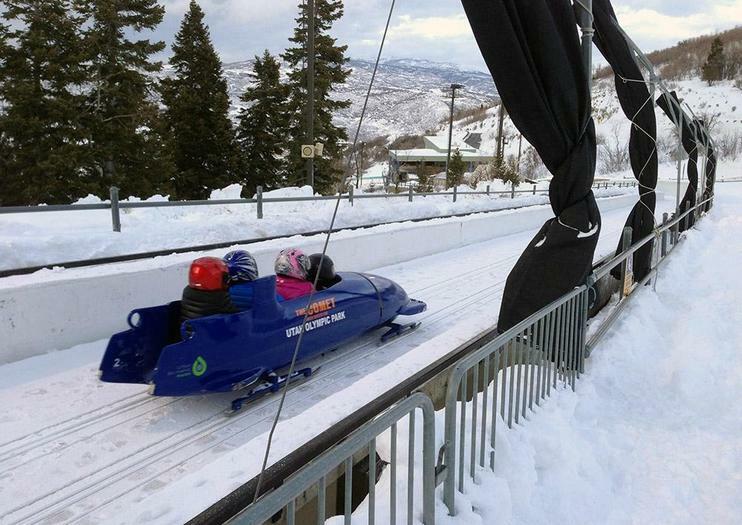 The park, located just outside downtown Park City, now serves as a training center for Olympic hopefuls and is a top tourist attraction for visitors and locals interested in Olympic history. Utah Olympic Park offers plenty of year-round adventure, from bobsled rides with a professional driver to zipline experiences to hiking and biking trails, plus a climbing wall for kids. You can learn about Utah’s Olympic past at the George Eccles Salt Lake 2002 Olympic Winter Games Museum, and explore the history of skiing in the American West at the Alf Engen Ski Museum. Guided tours of the Olympic venue offer the chance to stand atop one of the world’s highest Nordic ski jumps. Utah Olympic Park is ideal for those keen to explore the state’s Olympic history and anyone wanting to take a thrilling ride. Museum admission is free, but a fee is required for the guided tour and all activities. The on-site café is open 11am to 3pm Wednesday to Sunday and daily in summer. Utah Olympic Park tours and the ski museum are accessible to wheelchair users. Accessible outdoor activities are also available at the park through the National Ability Center. Utah Olympic Park is located just off Interstate 80 in Park City, 30 minutes from downtown Salt Lake City. The easiest way to get there is by car. Alternatively, take public transportation to the Kimball Junction Transit Center from anywhere in Park City and then catch the Utah Olympic Park shuttle from there. Utah Olympic Park is open year-round. The welcome center and museums are open daily from 9am to 6pm, and the shuttle from Kimball Junction runs from 9:30am to 5:30pm every half hour. The park sponsors World Cup events and competitions as well as special events such as high-flying freestyle aerialist shows; check the park’s event calendar online to see what’s happening during your visit. In addition to Utah Olympic Park, Games enthusiasts can skate on the record-setting ice at the Utah Olympic Oval, ski the Grizzly Downhill at Snowbasin Ski Resort, or ski the trails at the Soldier Hollow Nordic Center, site of the Nordic ski events. Many sightseeing tours of Salt Lake City visit the sites from the 2002 Winter Olympic Games, including Olympic Legacy Plaza, Olympic Village, and the Cauldron.